-- Paul Niquette, "Measuring the Moon"
hus do we begin our analysis of the puzzle with an idle non sequitur. As you know, the earth is about 25,000 miles in circumference, 8,000 miles in diameter. 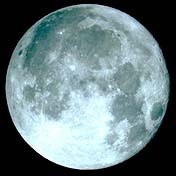 Taking the word "size" to mean surface area, we estimate that the moon must be about 2,000 miles in diameter. Space-age measurements, in fact, have confirmed that the moon is actually 2,162 miles in diameter and it is indeed 238,900 miles "farther away." A circle with a radius of 238,900 miles would have a diameter of 477,800 miles and a circumference of 1,501,053 miles ( times the diameter). That's the distance the moon travels in one 29-day orbit around the earth -- 694 times its own diameter for 360o. The diameter of the moon itself, therefore, corresponds to 360/694 degrees. That's 0.52o as viewed from the surface of the earth. he phrase, "[n]ear the horizon," in the statement of the puzzle suggests that the solution might be different at, say, midnight, when the moon is seen high up in the night sky. Such would be the expectation based on one of the most universal human experiences. Throughout history, people have judged the moon to be much larger when it is rising or setting than when it is seen at high elevations. A difference of 20% in diameter is not untypical, and some people are willing to swear that they see as much as a 2-to-1 ratio in size. Sophisticated solvers know that this is a mere illusion -- that, if anything, the moon ought to appear slightly larger overhead, since it is nearly 4,000 miles closer. In fact, an objective measurement of the angle subtended by the moon at midnight will confirm that it is nearly 3% larger than it is at moon-rise (0.5273o degrees vs 0.5185o). 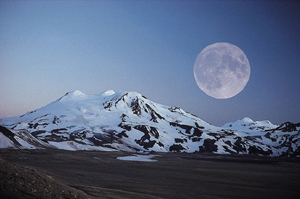 The pictures above illustrate what is known as the The Moon Illusion.